Paederia scandans , (Lour.) Merr. Paederia foetida is an aggressive, competitive vine. It can grow high into the canopy of trees in a variety of habitats. The vines climb over shrubs and trees, weighing them down and impeding regeneration. Paederia foetida also invades pastureland and is troublesome along roads and on power lines. Chemicals are often used as an effective method of controlling Paederia foetida. The seeds of Paederia foetida may be dispersed by birds and are also spread by the transport of rooted fragments. Paederia foetida has also been cultivated as an ornamental. Leaf stalks of P. foetida are commonly up to 6cm long. Leaves and stems have a disagreeable odour, especially when crushed. The flowers are small, greyish pink or lilac in colour and occur in broad or long, \"leafy,\" curving clusters. Petals are joined to form a corolla with 5 spreading lobes. Fruits persist through winter and are shiny brown, and nearly round, and are typically 0.7cm wide. Inside are two seeds that are black, round and often dotted with white, needle-shaped crystals (Langeland et al. UNDATED). P. foetida is a fast growing vine, that shows a wide ranging adaptability to different light , soil, and salt conditions. It is able to establish and grow above the frost line. It is also sensitive to fire. P. foetida flowers and fruits mostly in summer and fall (Langeland and Burks, 2000). P. foetida may grow high into the trees in a variety of habitats, from mesic hammocks to xeric sand hill communities, although it appears to prefer sunny floodplains and bottomlands. P. foetida can even grow under water (IFAS, 2001). It has been observed that P. foetida occurs frequently in tree gaps, and other disturbed areas (Langeland and Burks, 2000). The seeds of P. foetida may be dispersed by birds, and are also spread by accidental transport of rooted fragments (Langeland and Burks, 2000). Starr et al. 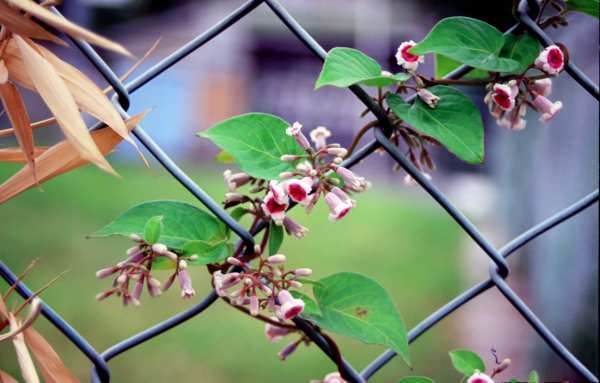 (2003) states that, \"P. foetida is dispersed throughout the world by humans who grow and cultivate the plant for ornamental or other purposes.\"
Recommended citation: Global Invasive Species Database (2019) Species profile: Paederia foetida. Downloaded from http://www.iucngisd.org/gisd/species.php?sc=632 on 22-04-2019. Starr et al. 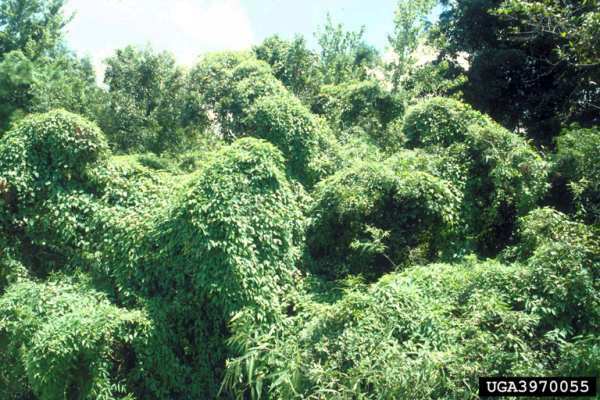 (2003) state that, \"P. foetida thrives in a variety of habitats and exhibit aggressive growth. 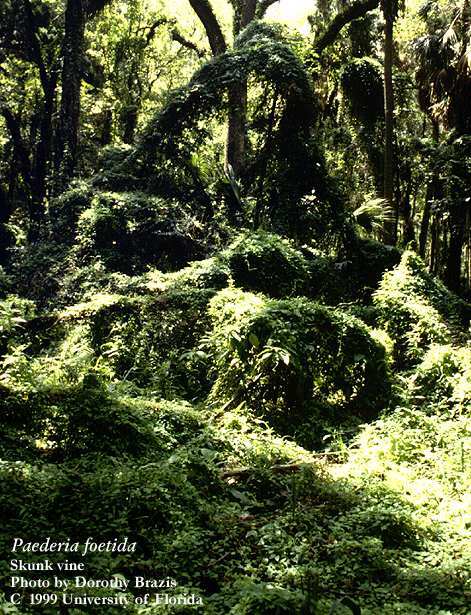 Vines climb on desirable shrubs and trees, weighing them down and impeding regeneration below the dense shade. \" P. foetida invades pasture land and causes problems along highways and on power lines. 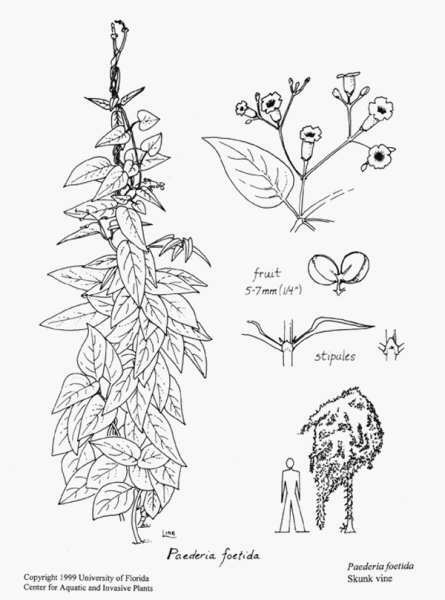 In the United States P. foetida has been observed to be the cause of smothering out portions of one of the few remaining populations of the endemic, federally endangered Cooley's water willow Justicia cooleyi (Langeland and Burks, 2000). 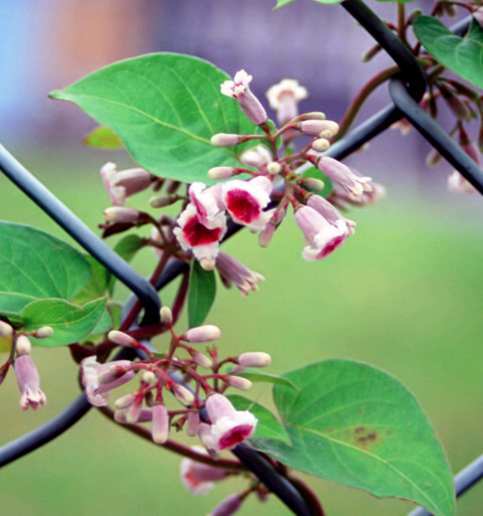 Preventative measures: A Risk Assessment of Paederia foetida for Hawai‘i and other Pacific islands was prepared by Dr. Curtis Daehler (UH Botany) with funding from the Kaulunani Urban Forestry Program and US Forest Service. The alien plant screening system is derived from Pheloung et al. (1999) with minor modifications for use in Pacific islands (Daehler et al. 2004). The result is a score of 21 and a recommendation of: \"Likely to cause significant ecological or economic harm in Hawai‘i and on other Pacific Islands as determined by a high WRA score, which is based on published sources describing species biology and behaviour in Hawai‘i and/or other parts of the world.\"
Control of the plant by chemical or mechanical means has to take into consideration damages to vegetation supporting the vine. Chemical: Triclopyr and glyphosate products have been used for controlling P. foetida (Starr et al. 2003) ). Langeland et al. (UNDATED) point out that complete control cannot be achieved with a single application and follow-up applications are necessary. Physical: They also add that hand removal of P. foetida in landscape situations will be necessary but large-scale hand removal in natural areas has proven ineffective. Flooding decreases vigor but P. foetida remain alive when submersed for at least 192 days. Informations on Paederia foetida has been recorded for the following locations. Click on the name for additional informations. Gann, George and Gordon, Doria R., 1998. 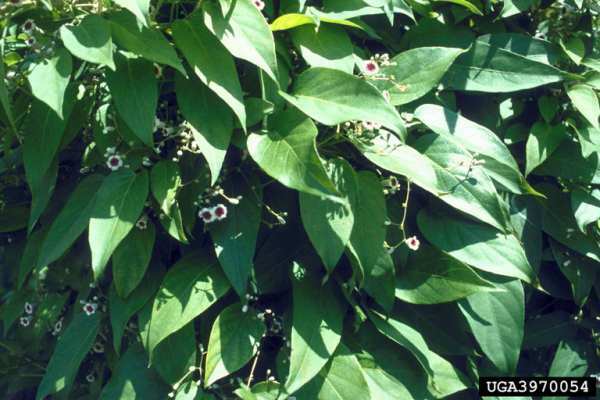 Paederia foetida (skunk vine) and P. cruddasiana (sewer vine): Threats and management strategies. Natural Areas Journal. 18(2). 169-174. Langeland, K. A., R. K., Stocker, and D. M., Brazis. UNDATED. Natural Area Weeds: Skunkvine (Paederia foetida). Florida Cooperative Extension Service: Institute of Food and Agricultural Sciences: University of Florida. Pemberton, R. W. and Pratt, P. D. 2002. In: Van Driesche, R., et al. 2002, Biological Control of Invasive Plants in the Eastern United States, USDA Forest Service Publication FHTET-2002-04, 413 p.
Pratt, P.D. and R.W. Pemberton. Skunk Vine, Paederia foetida. In: Biological Control of Invasive Plants in the United States. E.M. Coombs, J. Clark, G. Piper, and A. Cofrancesco, eds.Oregon State Univ. Press. Pp. 449.. (Book Chapter). Starr, F., K. Starr, and L. Loope. 2003. Paederia foetida. United States Geological Survey: Biological Resources Division, Haleakala Field Station, Maui, Hawai i.
Walker, S. E; El-Gholl, N. E; Pratt, P. D and Schubert, T. S., 2001. First U.S. report of Pseudocercospora paederiae leaf spot on the invasive exotic Paederia foetida Plant Disease. 85(2). 232. Diamond, Pete., 1999. Paederia foetida (Rubiaceae), new to the flora of North Carolina. Sida Contributions to Botany. 18(4). 1273-1276. IFAS (Institute of Food and Agricultural Sciences). 2001. Skunk vine (Paederia foetida). University of Florida, IFAS, Center for Aquatic and Invasive Plants. Summary: Information on history and identification of species. Pratt, Paul D. and Pemberton, Robert W, 2001. Geographic expansion of the invasive weed Paederia foetida into tropical south Florida Castanea. 66(3). September, 307. Puff, C. 1991. Medicinal uses of Paederia L. Opera. Bot. Belg. 3:159-164. Puff, C. 1991. 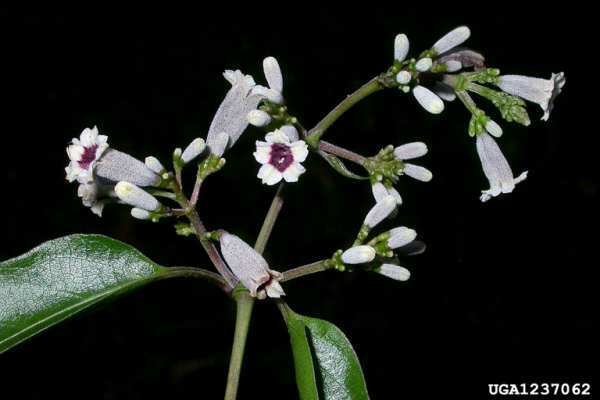 Revision of the genus Paederia L. (Rubiaceae-Paederieae) in Asia. Opera Botanica Belgica:207-289. Starr, Forest; Martz, Kim; and Loope, Lloyd L., 1998. New plant records from East Maui for 1998 Bishop Museum Occasional Papers.(59). 11-15. USDA-GRIN (Germplasm Resources Information Network). 2003. Paederia foetida. National Genetic Resources Program [Online Database] National Germplasm Resources Laboratory, Beltsville, Maryland.